The Gallery: Brunch v. Blunch! 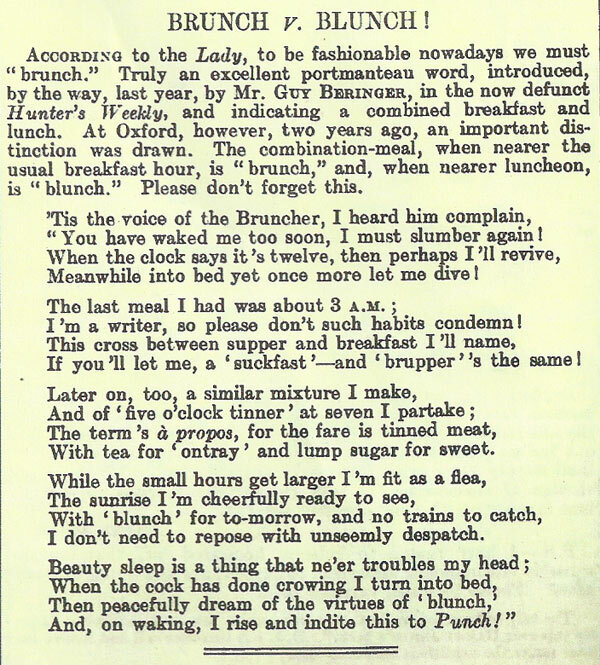 Brandon brought me this great article: an explanation for the word “Brunch,” from Punch, or The London Charivari, August 1, 1898. Will I see you later for suckfast? 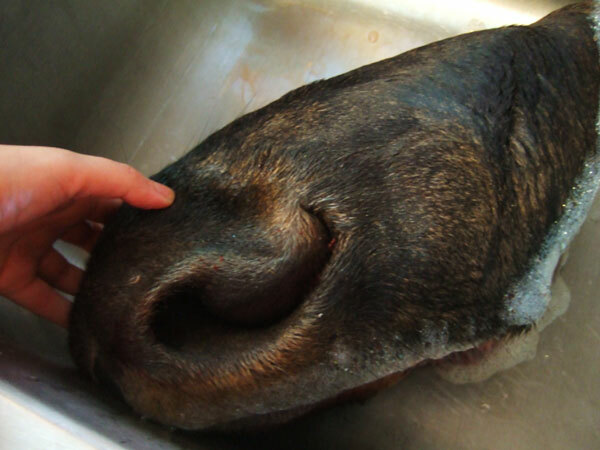 Or do you want to get together tomorrow for brupper? In our final installment of our exploration of the New York Historical Society’s culinary collection, we are taking a look at Unusual Meats, a pamphlet published in 1919. 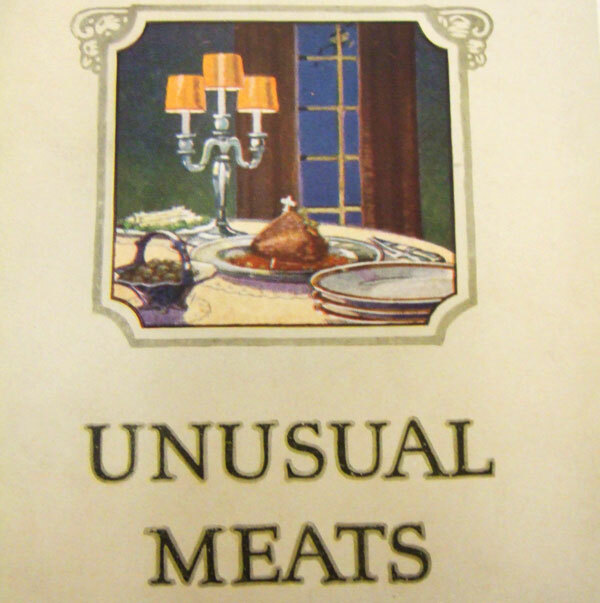 Because frankly, who wouldn’t be intrigued by a pamphlet called Unusual Meats? 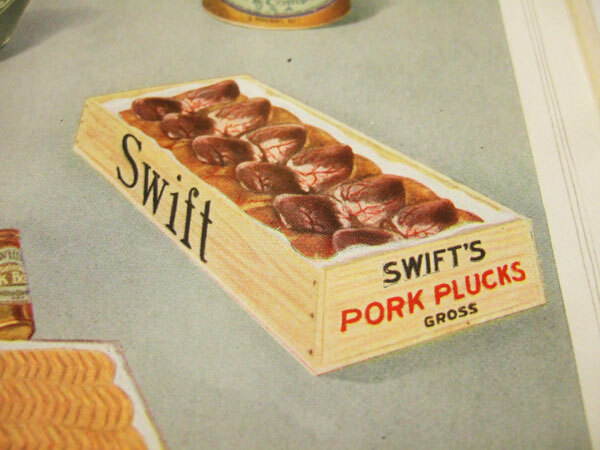 The meats in question are those sold by Swift’s Fancy Meats company, which are in fact not at all fancy, and are in fact offal. And other suspiciously named body parts. 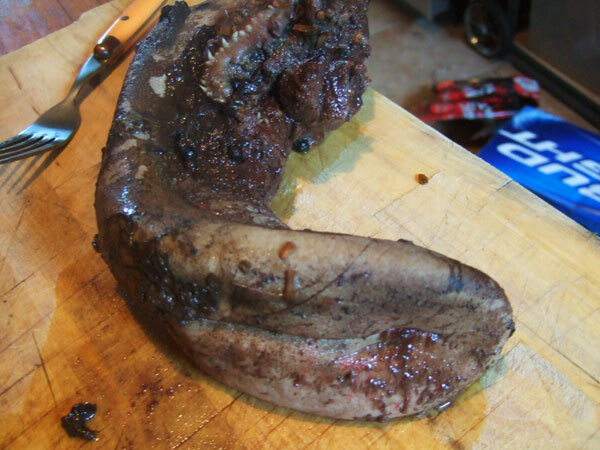 A “melt,” I found out, is actually the pancreas. 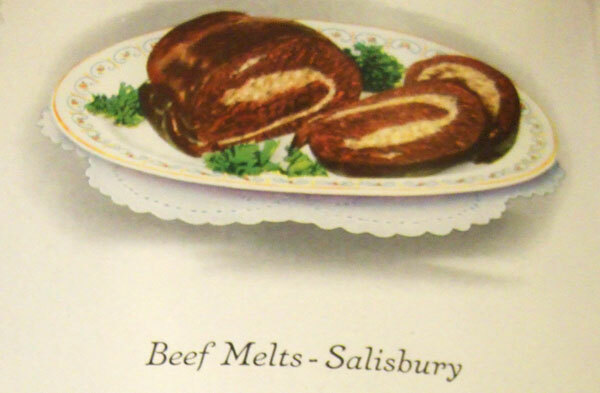 And I really wanted to try the Salisbury beef melts after pancreas meat was prominently featured in last week’s episodes of American Horror Story. 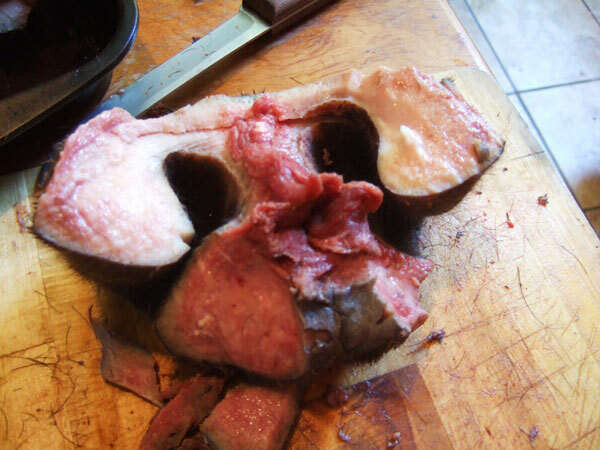 But butchers don’t seem to carry pancreas anymore, so all I could get my hands on was a veal heart. When I purchased the heat, I had fully intended cooking it according to the recipe below. 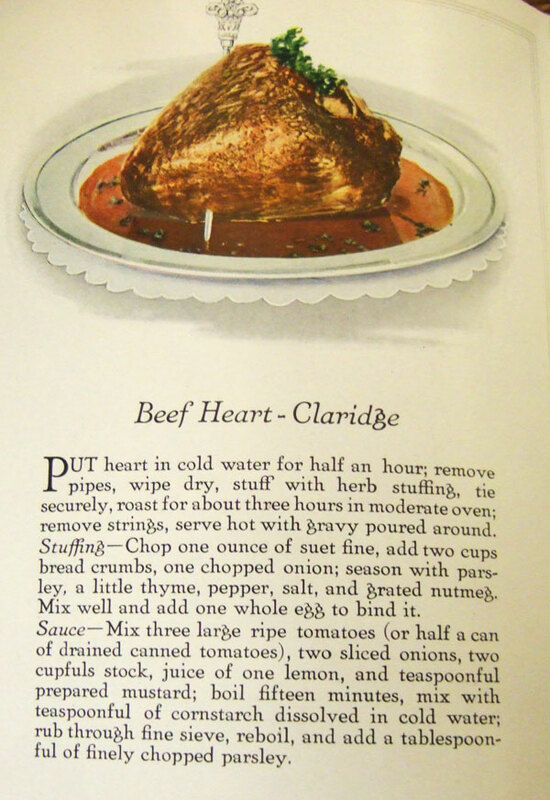 But at the moment, the heart is just sitting in my refrigerator. After the moose face…I’m just so tired. I haven't decided if this image is racist or super racist. 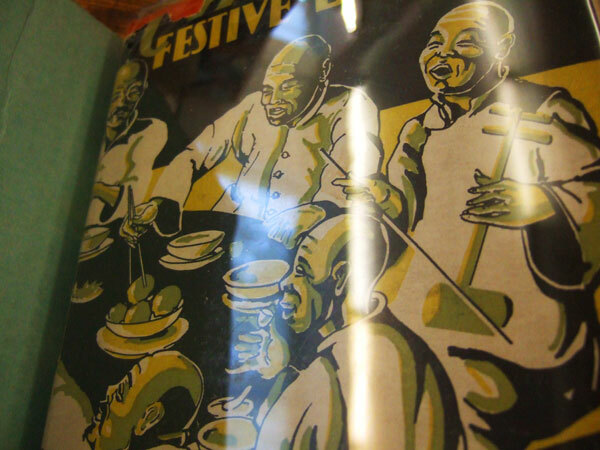 In our ongoing look at the culinary holdings at the New York Historical Society, today we explore the The Chinese Festive Board published in 1935 by author Corinne Lamb. 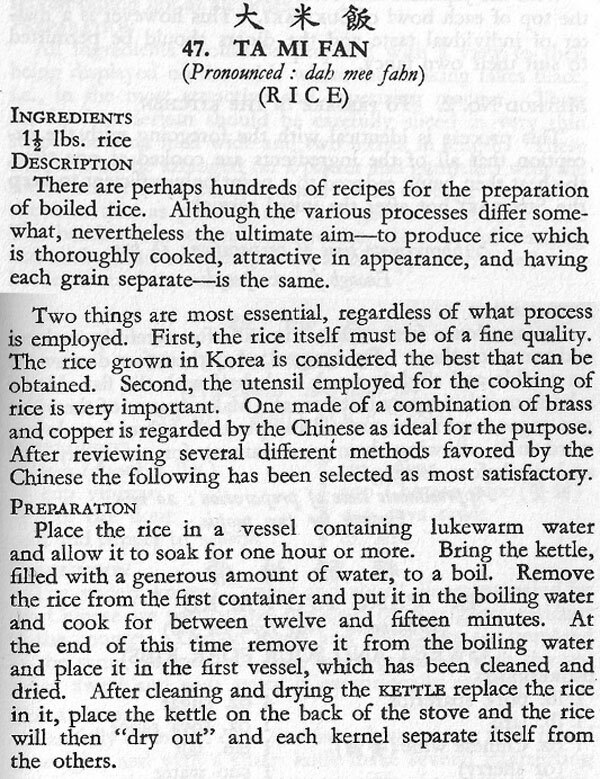 Written by a woman who seems to have lived in China for a number of years, it’s one of the earliest books I’ve seen on Chinese cooking in China (as opposed to Chinese-American cuisine). 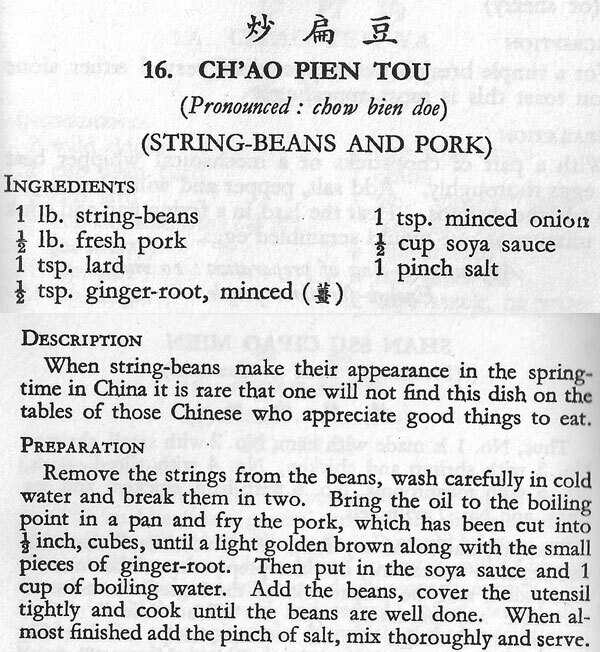 The first half is all about Chinese dinner customs and the second half is an extensive recipe book. 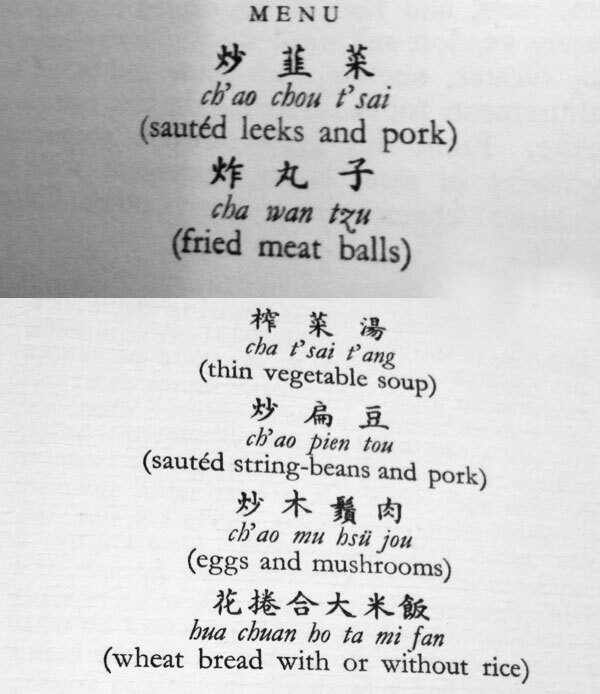 Lamb also includes helpful vocabulary for ordering in Chinese restaurants. The tone of the book’s writing is bizarre: it simultaneously condescends to Chinese culture, while praising the deliciousness of its food. The author straight-up uses ethnic slurs throughout the book. Keep in mind, this is a time in our nation’s history when immigration was banned from China. The book is a window into another era and we are definitely looking through the lens of an American perspective on Chinese life. 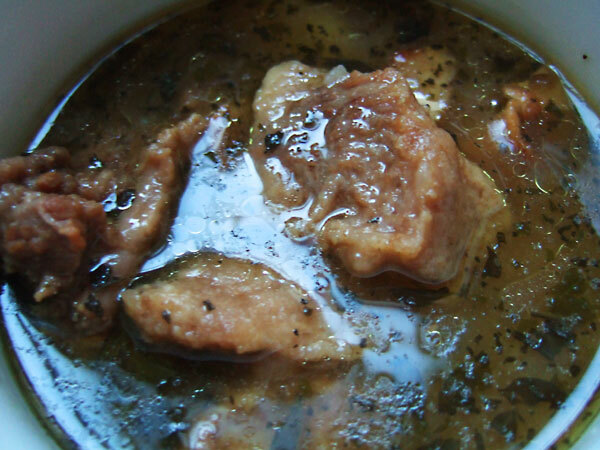 The recipes are interpreted to use ingredients readily available to an American housewife. 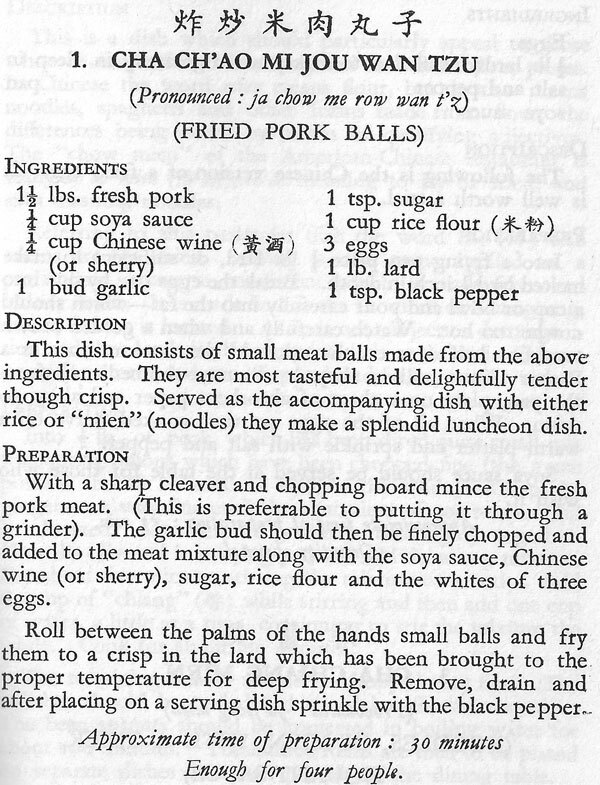 I decided to throw a 1930’s Chinese dinner party, following a sample menu from the book, as well as her description of a formal Chinese dinner party. I should have mailed a beautiful rice paper square to my guests, but instead I just texted them. They accepted: two friends from Brooklyn, Brandon and Madeline, the latter of whom spent a year living in China for work. 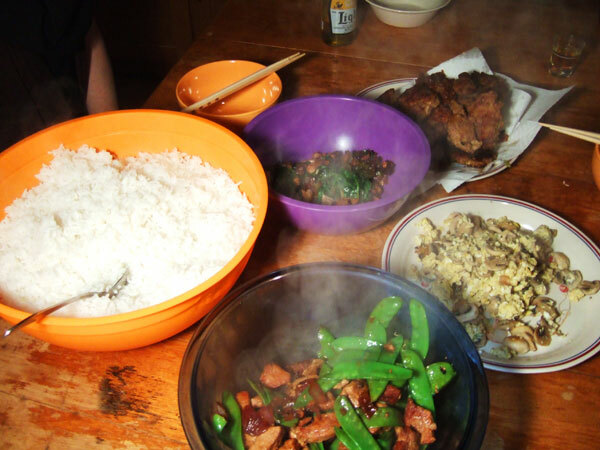 They came over on Friday evening, and while I finished prepping the food, I fed them peanuts and cups of green tea, which Lamb describes as the proper way to begin a feast. Then, just before I began cooking the food, we sat down for a round of drinking games. 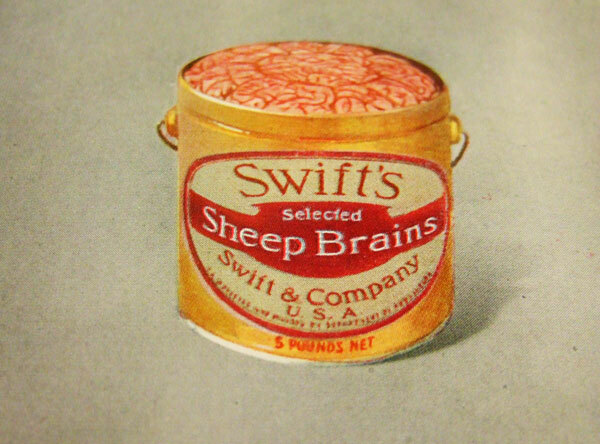 Lamb says drinking takes up only the earlier courses of the meal and is set aside once substantial foods come out. The drink of choice is Chinese rice wine, which Lamb describes as being close to sherry, and Madeline describes as “gross.” The liquor store didn’t have it, so I selected a nice bottle of sake, that I poured out in handsome shot-glasses, for lack of the appropriate vessels. Madeline also mentioned that beer was now an equally acceptable drink in China, which Lamb mentions was gaining popularity in her time. Madeline also said that drinking now seems to last through the entirety of the meal, accompanied by a tradition of toasting: Madeline toasted me for having them over, and we both drank. Madeline toasted Boyfriend Brian as well, and they both drank. I toasted Madeline to thank her, and we both drank… and so on. After we ran out of sake, and turned to beer, it begun to feel a little bit like a power hour. Then, thankfully, it was time to eat. 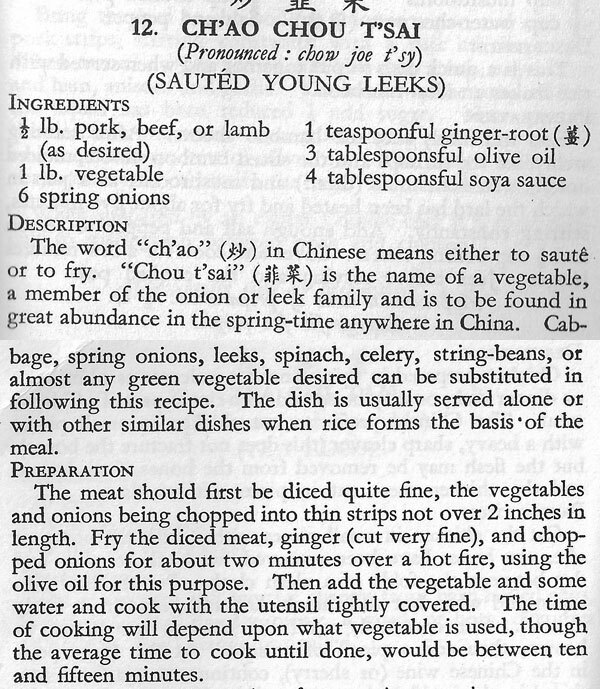 Lamb describes her recipes as coming “…Mostly from well known restaurants in Peiping…” known today as Beijing, in the north-east of China. I got four pans going on my stove top, three melting lard, one with olive oil, and continued to play the drinking games while I cooked. The recipes seemed so simple that they couldn’t possibly be delicious, let alone authentic. But I was ready to find out. My menu was as follows, based on the recipes Lamb provided in her book. I was nervous about this recipe, it being vastly different than the “one cup of rice to one and a half cups water” formula that I know of. But I tried it, using my big Calphalan pot with the inset strainer. And the rice turned out just as promised: not too wet or gooey, not too dry either. Just perfect, with every grain an individual. I was amazed. I made these slightly differently, after looking at another of Lamb’s recipe for Pork Meat Balls. I rolled them and then squashed them flat, which let me use less lard to cook them and allowed a greater surface area to get crispy. These were hands-down my favorite. 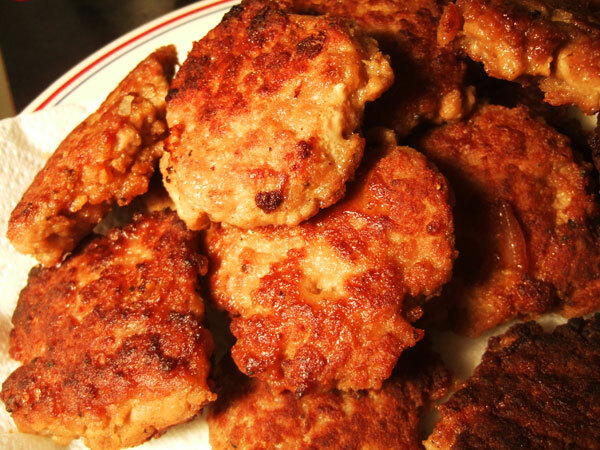 Crispy on the outside, soft and tender in the middle; so savory with an appealing texture. I ate the leftovers for the next two days and I would absolutely make them again. 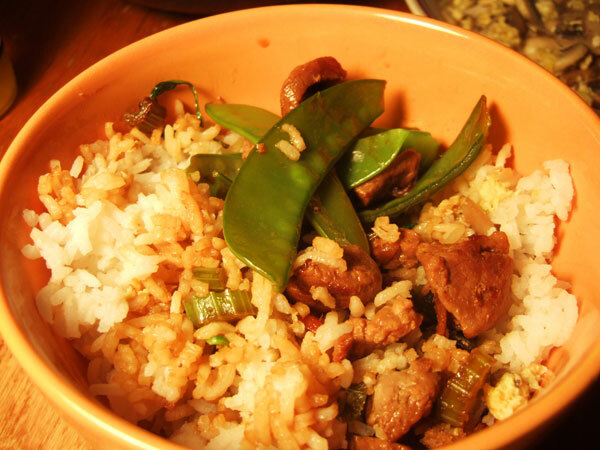 The sauteed pork dishes were the favorites of my guests, who loved to combine them both in one bowl of rice. 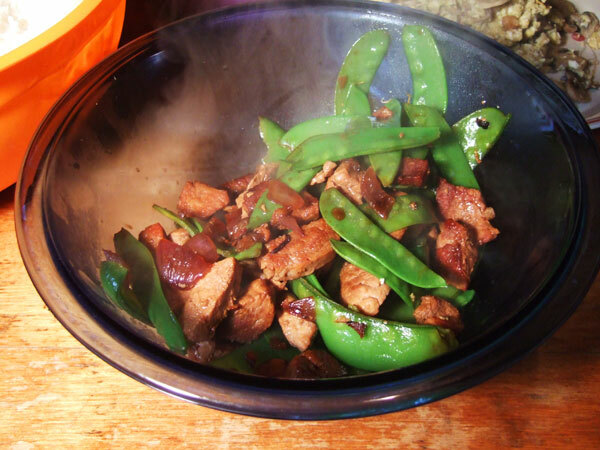 The soy and ginger made a lovely sauce, and the string beans were cooked to perfection. With a pair of chopsticks, beat eggs thoroughly. Add salt, pepper and wine and beat again. 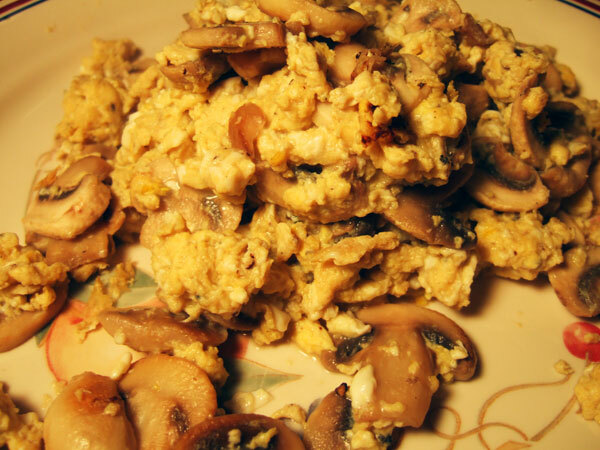 Heat the lard in a frying pan and sautee the mushrooms until tender, then add the egg mixture, and cook as you would scrambled eggs. On Chinese wine, Lamb says “It will be noted that many of these recipes call for Huang Chiu. or Chinese wine. Sherry is recommended as a substitute. 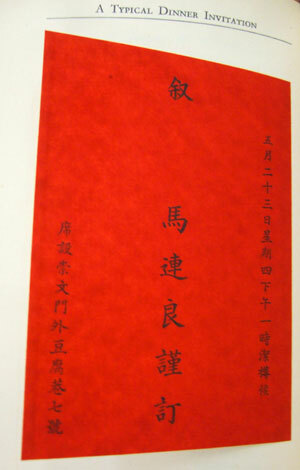 With the repeal of the 18th amendment it should not be long before Chinese wine will be available in every American city, and when that is so its use in in preparing Chinese food will be found preferable.” It wasnt’ available at my local liquor store, so I used a Japanese plum wine that taste very much like sherry. This, mixed with the eggs, was AWESOME. I don’t even like eggs, and I hate mushrooms, but this dish was just as good as everything else on the table. The wine was really a star when mixed with the eggs. It was a surprise. We ate in the way lamb suggests, Family-style, using only bowls and a pair of k’uia tzu, or “quick little boys,” or better known here as “chop sticks.” We topped big piles of rice with the sauteed dishes, sometime two or more at once. 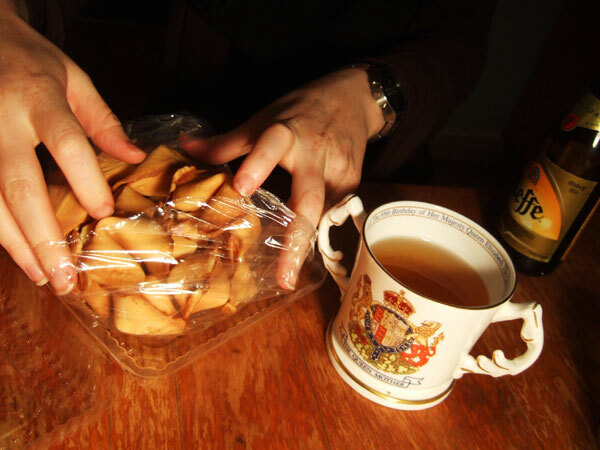 We ended in a very Chinese-American way with more tea and a few baked sweets: sugar cookies, lotus seed cakes, and “R-rated” fortune cookies; all of which were from Chinatown in Manhattan. Madeline somehow found "R-rated" fortune cookies. The food was delicious–really delicious. But was it authentic? I have no clue– but I’m looking in to it. 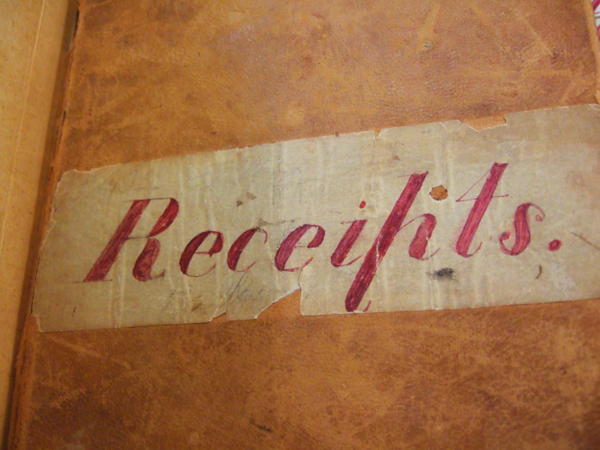 The front cover of Mrs. Maria Sneckner-Lintz’s Receipt book, from the NYHS archives. This post is the first in a series of three celebrating the re-opening of the New York Historical Society. We’re going to focus on examples from the NYHS’s culinary holdings. Today, we’re looking at a beautiful manuscript from 19th century New York; beautiful both for its physical appearance, and for the important information it gives us about daily life in the city 100 years ago. The book is written by Mrs. Wilbur Lintz (nee Maria Sneckner), who was born in 1817 and passed in 1889. During her life, she decided to record her favorite recipes and culinary knowledge. Overall, this book gives us a peek into what was being cooked in a middle-class, New York kitchen. Mrs. Lintz was a very organized woman; her cookbook is alphabetically indexed in a way that allowed her to add to her recipes over time. Sneckner is an old Dutch name, and in that line, the manuscript features several traditional New Amsterdam-style recipes. The recipe book includes three different recipes for New York Cakes, a cookie flavored with caraway. 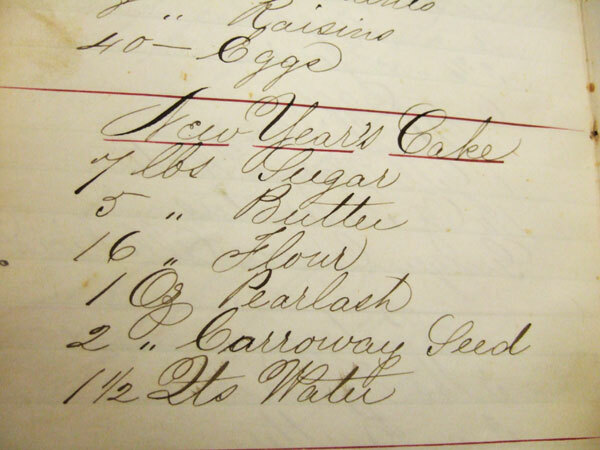 In the Dutch tradition, these cakes were passed out to visitors on New Year’s Day; the practice of visiting on New Year’s was revived by the upper and middle classes of New York in the middle of the 19th century. Additionally, this manuscript features recipes at the height of their fashion and modernity, like this one, at left, for Parker House Rolls. 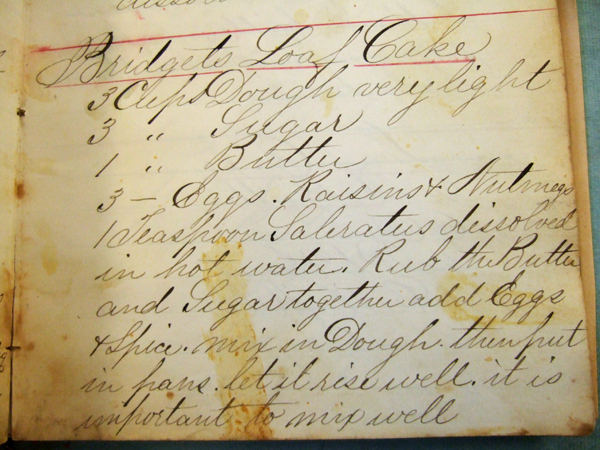 Parker House Rolls.–One quart of cold boiled milk, two quarts of flour. Make a hole in the middle of the flour, take one half cup of yeast, one half cup of sugar, add the milk, and pour into the flour, with a little salt; let it stand as it is until morning, then knead hard, and let it rise. Knead again at four o’clock in the afternoon, cut out ready to bake, and let them rise again. Bake twenty minutes.–Mass. Ploughman. The Parker House still exists, and still serves its famous rolls, as well as its other great creation, The Boston Cream Pie. The 1840s were a decade of dramatic increase in immigration to America, due in part to the famine that hit Ireland, decimating the primary food source of potatoes. The political situation was far more complicated than just that, but the results was the emigration of about 2 million Irish to points around the globe; 1.5 million landed in American; and by the 1860s, one in every four New Yorkers was born in Ireland. Many single Irish women immigrated here to take positions in domestic service, as there was an incredible demand for servant labor in American household. As a result, “Bridget” became the generic, ethnically-charged term for a servant. Bridget learned American cooking from her Misses; and in turn, influenced the American kitchen with cuisine brought from home. 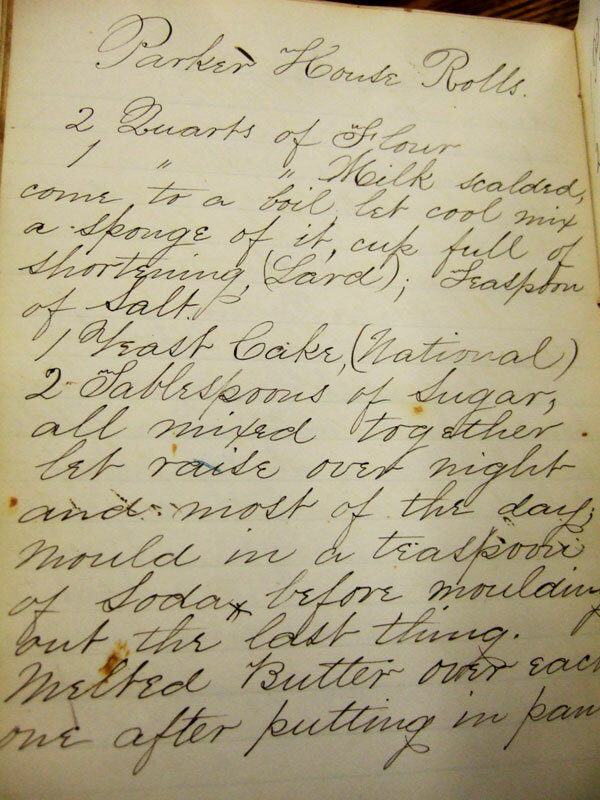 Mrs. Lintz’s Loaf Cake recipe isn’t just important because of the cultural trend it reflects; but because she took the time to copy it from Mrs. Beecher’s Receipt book, it illustrates that this recipe was actually popular and it was being made in family kitchens. From Mrs. Beecher’s Domestic Receipt Book, by Catherine Beecher, 1848. This is a basic bread recipe I received from a great breadmaking class at the Brooklyn Brainery. 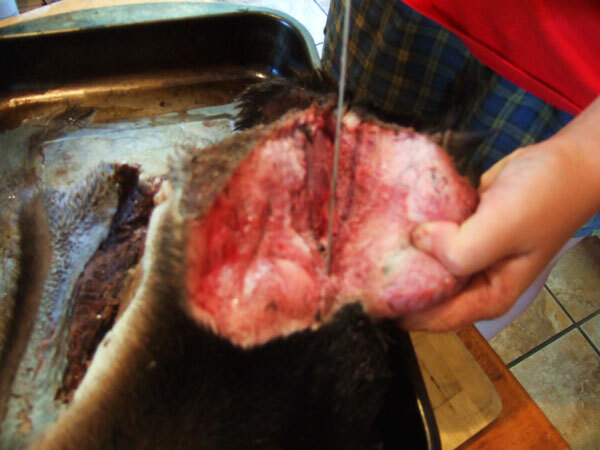 Frozen bread dough can also be subsituted. Place water in a clean, glass bowl; sprinkle yeast over surface. Whisk gently with a fork. Set aside. Combine dry ingredients and oil, mixing with a fork. Add yeast water, stirring to combine. As the dough comes together, form into a ball and place on a clean surface. Knead for 3 minutes, adding more flour or water as necessary. A wet dough works well for this recipe. 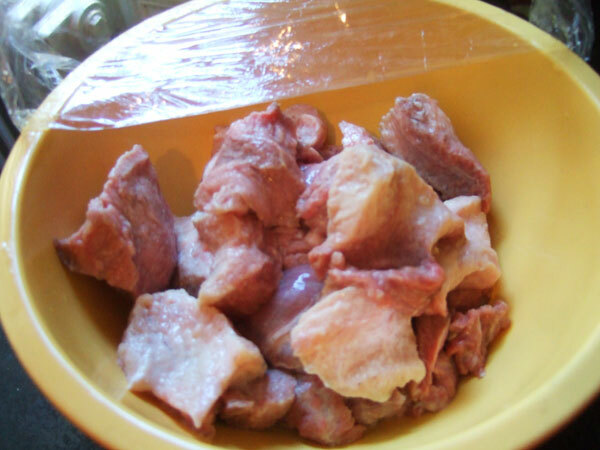 Place in a bowl and cover with a clean towel. Allow to rise for one hour. Using a fork, cream together butter and sugar. Add nutmeg and baking powder, then eggs. Mix until thoroughly combined. Stir in raisins. Add ball of bread dough to sugar mixture. 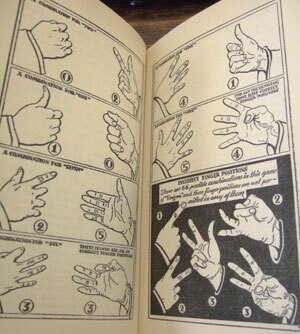 Combine thoroughly using your hands: first fold the dough into itself, incorporated the sugar mixture; then squeeze and mash the dough with you fingers until you have a dense, sticky batter. Set aside and allow to raise for 20-30 minutes. Butter two small loaf pans and preheat your oven to 425 degrees. Bake for 15 minutes, then reduce heat to 350 degrees and bake 15 minutes more. Remove from oven and cool, in pan, on a wire rack. 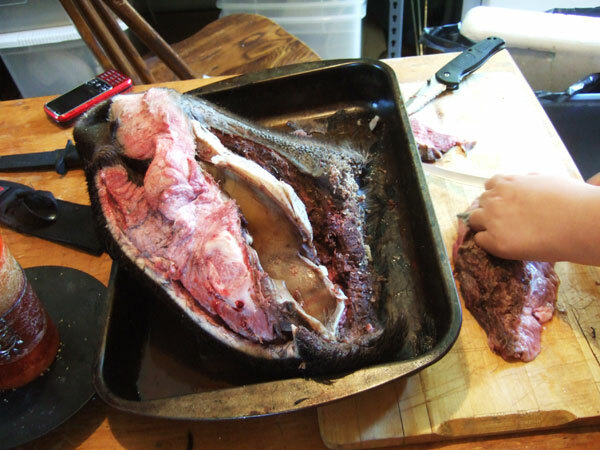 Remove from pan and allow to cool completely on the wire rack, or serve immediately. At these proportions, the Bread Cake came out super ooey gooey buttery sugary, to the point where it formed caramel on the bottom of the pan, like an upsidedown cake. 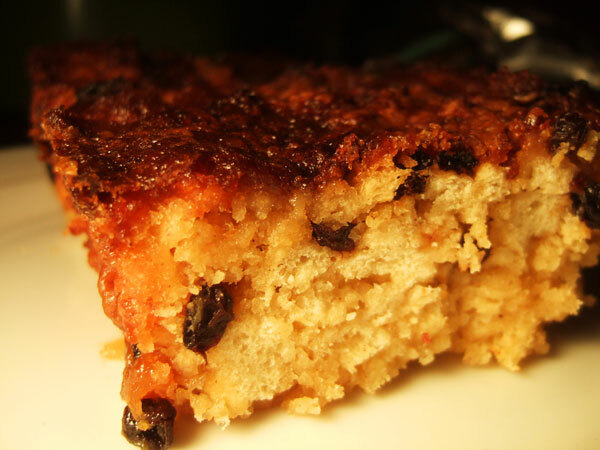 Overall, the texture was something like bread pudding. I don’t think that was the intended result of this recipe, but I don’t think I care. The texture is amazing and delicious. Sadly, the caramel bottom stuck to the bottom of the pan, but I bet it would be even more awesome with it. I wasn’t so fond of the flavor, though: heavy doses of nutmeg in my baked goods just make me think of the 19th century, but doesn’t hold any appeal to my modern taste buds. If I were to make this again, I would use apples and cinnamon instead of nutmeg and raisins I would line the loaf pan with parchment, so I could lift the whole thing out without losing the caramel, and I would serve it hot from the oven. In fact, I think I might do just that. I’ll let you know how it goes. Bridget’s Bread Cake – not particularly photogenic. To celebrate the NYHS reopening, I’m going to celebrate their collections! The library at the NYHS has immense culinary holdings, both in terms of a manscript collection and historic and vintage cookbooks. And ANYONE can access them. 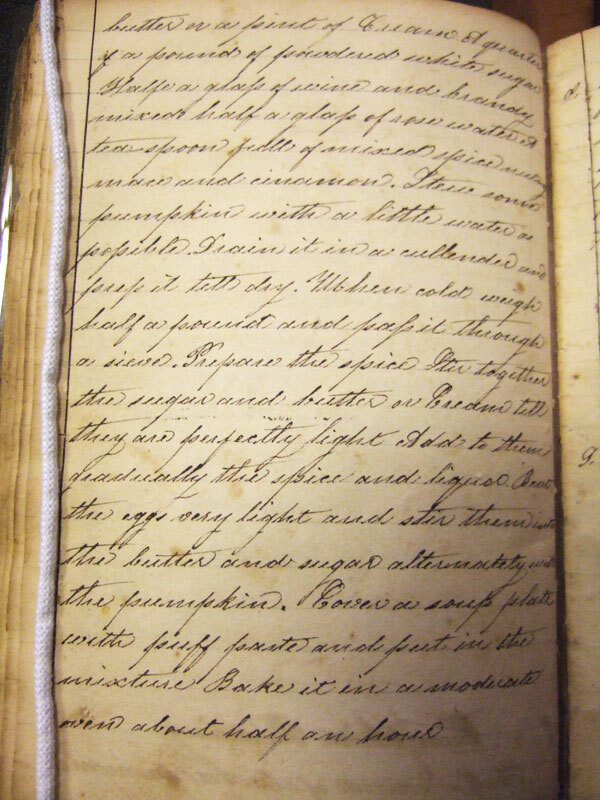 That’s the amazing and beautfiul thing about libraries: you can reqeust to look at a 200-year-old, handwritten manuscript, and they’ll BRING it to you, and you can TURN ITS PAGES. It’s historic, yellowed, food-stained, love-worn pages. Talk about a connection to the past. Starting tomorrow, and continuing into next week, I’m going to feature a few gems from the NYHS collection: an historic New York manuscript, an ethnic cookbook from the turn of the 20th century, and a pamphlet entitled “Unusual Meats”. I think I may have just summed up this blog in three books. So join me in my mini-celebration, and learn more about the goings on at the NYHS here. Sweet n’ Sour! Apple compote. I always like to share a good apple recipe this time of year, so you can take advantage of the fall apple bounty, or use up a couple of fruits on the verge of going bad. This is a really unique one from the Manual For Cooking and Baking. The lovely lady pictured is Hinde Anchamnitzki (pronounce Hinn-dah Ahn-prwah-nit-ski), who published the first Yiddish cookbook in America. 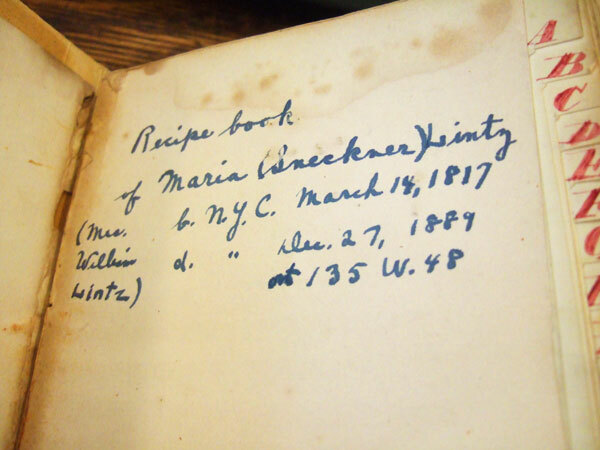 The Lower East Side Tenement Museum is working on translating it, and is planning on building a larger program around her seminal work utilizing their new demo kitchen space. Below is her recipe for “English Apple Compote” that plays with the sweet/sour flavors that traditionally appear in Jewish cooking. I’ve tried it, and it’s fantastic. It calls for “Sour Salts,” which is citric acid; I was able to find it at Williams Sonoma, of all places. It gives the dish the mouthpuckering Sour Patch kids sensation one doesn’t normally associated with turn-of-the-century food. 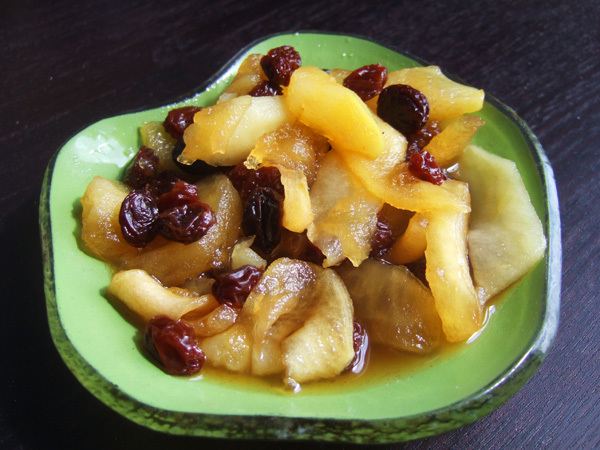 Additionally, cooking the raisins in the sugar syrup teases the flavor out of the dried fruits, and give the dish a distinct raisin tang. 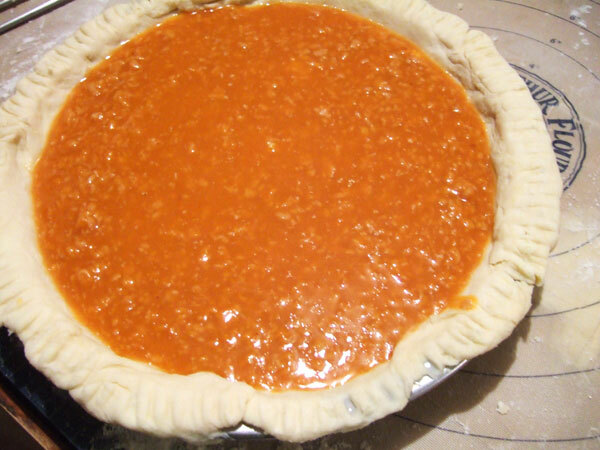 The original recipe is below; it was traslated for me by vice president of education at the Tenement Museum, Annie Polland; I modernized the recipe myself. 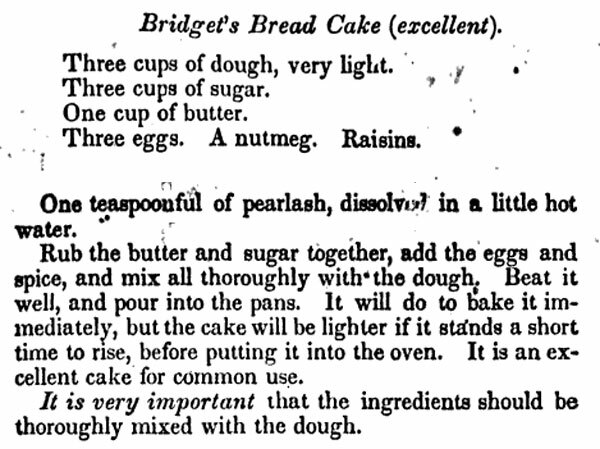 From Manual For Cooking and Baking by Hinde Anchamnitzki, 1901. Combine sugar, raisins, sour salt and water in a large pot; cook over a medium heat until all of the sugar is dissolved. Peel and core apples, and cut them into 1/4 in. slices. Cook in a large pan, covered, until the apple slices are tender when pierced with a fork. Add to sugar syrup; allow to cool, and serve. If you like, you can pair this compote with a pie crust, like this one made of Matzo meal. 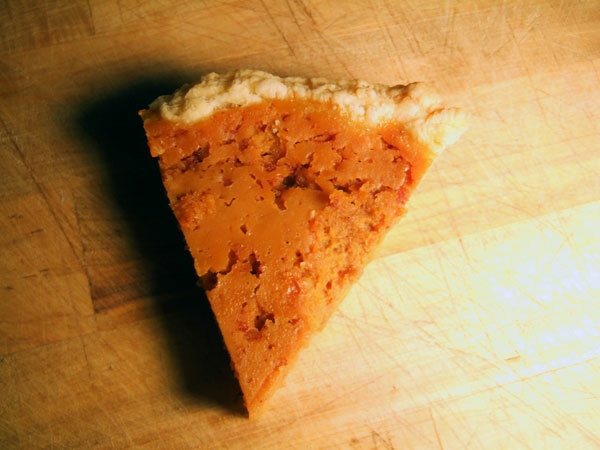 The crust is tasty enough to serve any time of year, not just for Passover!